Want some free things to do in September in the Netherlands? Are you depressed that the summer is nearly over? Or maybe all of those summer festivals and beers on the beach in this gorgeous weather has bled you dry of money? Don’t worry, not only is September due to be a sunny month (check our weather forecast), but there are plenty of free events for you to attend too. If boating, kiting, museums, cheese and the royal family is your thing, then you’re in luck. The International Kite Festival in Scheveningen is back for its 40th year! If you know Dutch beaches well (or the Netherlands in general), then you’ll know that there is no shortage of wind. Therefore, this is the perfect location to see some incredible kites floating over the shore. Kite enthusiasts and kite builders will literally gather from all corners of the earth to showcase their work and you will see a variety of different cool shapes and colours. Some of them will be some of the biggest kites ever flown in the world. You then can have the opportunity to attend kite workshops. Then at night, there is a light show, so it’s literally a whole day of this incredible free event. Don’t be fooled though, it’s not a children’s event and we won’t judge you for going. 😉 It’s a perfect event for young and old. See you there! Annually Prince’s Day is held on the 3rd Tuesday of this month. This is the day where the King conducts his speech about what the government policy will be for the next year. It’s definitely one of the most important days for Dutch politics (apart from election day of course). 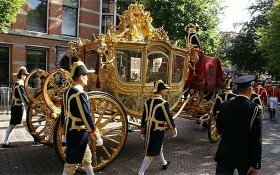 In order to conduct his speech, the King rides in his Golden/Glass Carriage, from the Noordeinde Palace to the Ridderzaal and then back again. For anybody who loves a royal visit, this is the perfect opportunity for you to see the Golden/Glass Carriage. People gather at the palace and all along the whole route in order to see this amazing ceremonious occasion. I actually ended up in the Hague on that particular day by fluke once and actually saw it myself. It’s well worth a watch. With Rotterdam being the biggest port in the whole of Europe, it doesn’t celebrate this occasion lightly. Annually, in the first weekend of September, Rotterdam celebrates its port over a whole weekend. During this weekend members of the public can see for themselves how the port runs, with behind-the-scenes tours and activities. These include excursions, seminars, demonstrations and naval activities. There are also shows and performances along with a spectacular firework display and then a DJ on the Saturday night. So be sure to attend this celebration, as it’s going to be a big one! This year Rotterdam is celebrating its aim to be the most sustainable in terms of renewable energy sources. Heritage days are celebrated all over Europe, but for the Netherlands, which is jam-packed with amazing historical sites, it’s an incredible weekend for us all. Around 4,000 historical buildings open up to the public during this period. There will be different activities, guided tours, music and more. Best of all, during this period, you are free to enter – so you can learn so much about the Netherlands and Dutch heritage, free of charge! The difficult part is then deciding where to go, as most municipalities participate, so in each place, there will be tons of different sites open to the public (look out for the Open Monuments Day flag outside). Make sure you get down there early too, as thousands of people participate every year. 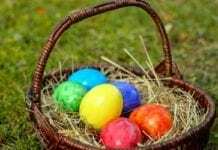 Check your municipalities website for more information on what they will be holding on this weekend. This cultural event is not one to be missed. Yes, it’s time! The cheese markets are making a come back. The cheese market is on every Friday from 10am – 1pm (and every Tuesday evening in July and August from 7pm – 9pm). Cheese markets are a traditional Dutch experience, with lots of different Dutch cheeses layering the streets and cheese hauling carriers. This includes witnessing cheese maids walking around the market and traders trading their cheeses. There also have a variety of programs and performances on. This cheese-market tradition is said to have gone on since the 1500’s. So if you’re after a traditional asf experience, head to Alkmaar at the end of this month! One of my favourites out of all of the free things to do in September in the Netherlands. So there you have it: our 5 free things to do in September in the Netherlands. Stay tuned for our next instalment next month! What will you be doing this month? Let us know in the comments! If you want more of this, don’t forget to join our Facebook group… you know you wanna.